Tag Archives for " Jonathan Greechan "
It’s guest post day here at Duct Tape Marketing and today’s guest post is from Jonathan Greechan– Enjoy! Networking takes time, so any business goal that needs to be met within 3 months through networking is usually unrealistic. Therefore, list out two primary goals for the next 3 – 6 months, and then two secondary goals that you foresee being a priority in the 6 – 12 month range. 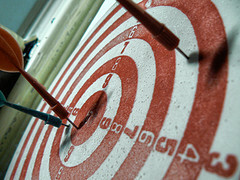 You don’t target a company – you target a person. Go narrow and deep (versus wide and broad), and find out who makes the purchasing or partnership decisions at the companies you are targeting. You can usually find this information by checking the speaker roster (and topics) from industry events, corporate press releases, and LinkedIn. Scroll through the contacts of the people who come up in your searches – you’ll often discover positions and companies you didn’t know existed. Once you’ve found a search that works best, be sure to “Save This Search” so you can use it in the future. Use LinkedIn for research, but not for contacting. “InMail” and LinkedIn referral requests have become so bogged down by recruiters that most well connected people I know find them un-usable. Now that you have your list of strategic contacts, it’s time to start your outreach via email, which should come in two parts. One of my favorite rules of marketing is to always provide value before asking for it in return. This is doubly true for networking, and it does not even have to require a lot of effort – just a small “out of the blue” gesture to a strategic contact can pay large dividends. Whatever you do, just provide value, respond quickly, and keep the conversation going. After you have provided value and some time has passed, it is time to ask your contact for an introduction to your target. One sentence on your company, and what you are looking for. One sentence on the intro, which includes a mechanism to make the intro feel natural. Networking is not a “one-off activity”, but if you follow the steps above, you can start leveraging your contacts to help build your business NOW. Jonathan Greechan is a Partner and the Head of Marketing at the Founder Institute – an entrepreneur training and startup launch program that has helped launch over 1250 tech companies across 6 continents. In addition, he is a Partner at TheFunded.com, and the Executive Producer of the Founder Showcase, a leading startup event in Silicon Valley. Jonathan has been heavily involved in startups and online marketing since 2004, and has advised hundreds of technology companies. Follow him on Twitter at @jonnystartup.